east side bride: Best places to eat/drink/be merry in CHICAGO? I know it's last minute but I'm going to Chicago this weekend and the last time I went was over 5 years ago with my frat-tastic and very cheap college boyfriend (read: all we did was eat pizza and go to some weird Dave and Buster's style bar). Do you know anyone who could give me some tips on the best places to eat/drink/be merry? Or would you be willing to put it out to your readers? Just call me A MIRACLE WORKER. Actually, Hillary is the miracle worker. (Remember Hillary? She's the one who overshared her wedding over here.) She's a graphic designer, obvs, and she lives on the north side with her very cool husband and a cat. Chicago is a city of neighborhoods. I realize that most cities are, but they are really distinct here (like, segregation distinct). In my opinion, there's little reason to spend time downtown, aside from going to museums. You'll probably want to hang out on the north or west sides. As an ESB reader, my guess is that you'll prefer the following neighborhoods: Logan Square, Wicker Park / Ukrainian Village and Andersonville. There are other great places to hang out (West Loop, West Town, Ravenswood/Lincoln Square, pockets of Lakeview, Pilsen), but these are the areas where I spend the most time. Chicago is on a grid system. Getting a brief understanding of how the streets are set up will help you get oriented. The train system here is the CTA (Chicago Transit Authority), but is also referred to as the "el" (which stands for elevated). The trains are fairly easy to understand. You'll probably only ride on the blueline (Wicker Park/Ukrainian Village and Logan Square), redline (Lakeview, Andersonville) and/or brownline (Lakeview, Lincoln Square) – all of which can be caught downtown. Things are changing here a ton right now. It seems like a bunch of new stuff has popped up in the past year (and there's a lot of new stuff on the horizon). I'm actually suggesting a few places I haven't been because they've been so hot. Fellow Chicagoans, please chime in! Stay at Longman & Eagle (in Logan Square) if you can. Otherwise, there's a new hotel in Lakeview that looks nice called Hotel Lincoln. There's another new hotel which I just heard about called Acme Hotel Company (which is downtown, in River North). 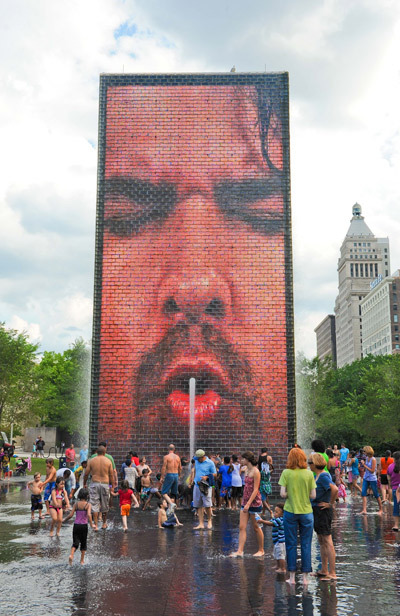 Art and architecture are some of the best things Chicago has going for it. The new(ish) modern wing at the Art Institute is pretty special and there's an exhibit I want to check out right now about a local architecture firm, Studio Gang. The MCA is fun and managable. If you are really into architecture, the Architecture Foundation's boat tour is popular. You could also take a trip out to Oak Park to see the Frank Lloyd Wright Home & Studio and/or head down to IIT to see the student center by Rem Koolhaus and the other buildings by Mies van der Rohe. Millennium Park is pretty slick – it's fun to just walk around all the different areas and the big installation art there is pretty great, even if it's a bit touristy. If you'd rather listen to music, I'd check what's happening on Oh My Rockness. If you don't know anything specific, and just want to hear live music, I'd check out the Empty Bottle – it's my favorite venue. If you want to check out comedy (it IS Chicago)… I'm sorry, I'm not much help. Live comedy kind of scares me. I saw Too Much Light Makes the Baby Go Blind once and really liked it. Or you could check out Second City. If you are sportier or more outdoorsy, you could try any of the following: kayak the river (fun but kind of gross); bike/walk the lakeshore path; get drunk at Wrigley; hang out in one of many many parks; go to the beach. Gaslight Coffee Roasters – this place is new and I actually haven't been there during the day (it soft-opened last Saturday) but I went to an after-hours party there Friday and it was pretty slick. Lula – Probably my favorite restaurant in Chicago, totally classic. 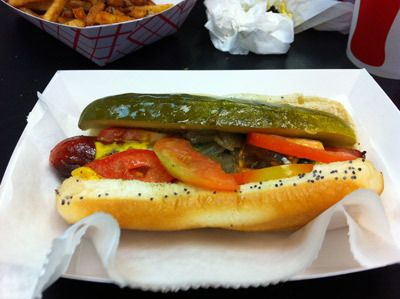 Hot Doug's – A classic Chicago dog is pretty great and you can get it anywhere, but might as well get it here along with an antelope sausage and some duck fat fries. Kuma's – Great great burgers. Longman & Eagle – Great drinks but better for drinking AND eating b/c the bar space isn't big. Revolution Brewing – One of our many many local breweries. Hopleaf – This is a very popular Belgian bar – classic Belgian and new American beers alongside mussels and some great sandwiches. Coffee Studio – Great coffee bar (owned by 2 alums of my graduate design program). Tweet – One of my favorite places for brunch – good vibe and great breakfast cocktails. City Provisions – Cleetus (the owner and head chef) is amazing. Go here on Sunday for brunch or to buy food out of deli case or off shelves. Fountainhead – Great beer bar with excellent roof (food = meh). Tiny Lounge – Cool little cocktail bar – gets super crowded at night on the weekends; good food. Intelligentsia – One of the biggest coffee brands in the city, the downtown location is hip (but doesn't have a ton of seating). XOCO – Rick Bayless's taqueria. Good for lunch if you are downtown. Pastoral – Great sandwiches or picnic basket-type meals to go. Also great place to pick up wine or foodstuffs to take home with you. Watershed – One of the only bars downtown that I frequent. Everything here is from around the Great Lakes region. Bluegrass on Thursdays. Bowtruss – Another new coffee place. I haven't been to the location but I'm currently drinking my buddy Max's collaboration blend. FishBar – I love this place – I've had so many good experiences here. It's cool and casual and has a great staff. 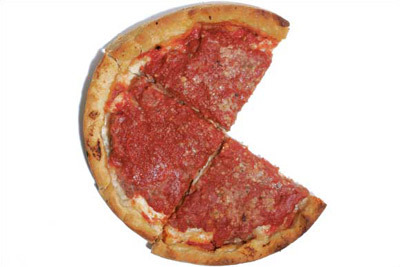 Pequod's – My husband's favorite pizza in the city. Gingerman and Sheffield's – If you end up at Wrigley, these are the only bars to go to nearby that aren't frightening. Good beer bars. Delilah's and Local Option – 2 bars in this preppy area that don't feel like they belong here. Delilah's is a whisky bar, Local Option a beer destination – but both are kind of punk rock (at least in my estimation). Piece – Pizzeria and microbrewery – more of a sports bar but really good pizza. Big Star and Antique Taco – The former has amazing food but I've had crappy service there; the latter I've never actually been to but heard good things. Map Room – Classic Chicago beer bar. Small Bar – Another (smaller) beer bar that I think has been revamped a ton since I was last in (have met the owner a few times). 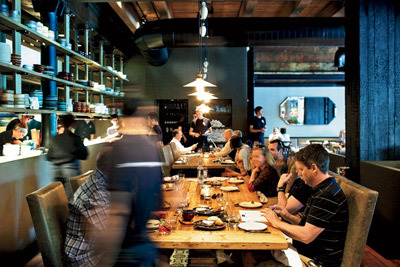 Girl and the Goat – one of the most talked about Chicago restaurants (Stephanie Izard won Top Chef). I hate hyped places but this lived up to everything I had heard. Haymarket – Chicago brewery kind of sports bar(ish) but the beer is good. Maria's Packaged Goods – Another hip beer bar (in Bridgeport). Pleasant House Bakery – This awesome savory pie place is near Maria's in Bridgeport. Simone's – ANOTHER hip beer bar (in Pilsen). Downtown is full of large chain stores. If you are from a tiny tiny town, this may be fabulous for you. The sales tax is HIGH but there's a huge selection. We have all of those cheap-but-trendy stores like Forever 21, Zara, Topshop, H&M, etc. Check out Michigan Avenue and State Street. If you are looking more for fancy name-brand stuff, you'll want to do the Gold Coast area around Oak Street. I think the best area for boutique shopping is Bucktown (Damen between Webster and North, maybe – and then down Milwaukee). Penelope's is my favorite boutique (on Division in Uk Village). Haberdash for great for men (River North). Akira is a local chain here. Dovetail looks awesome but I haven't been yet. 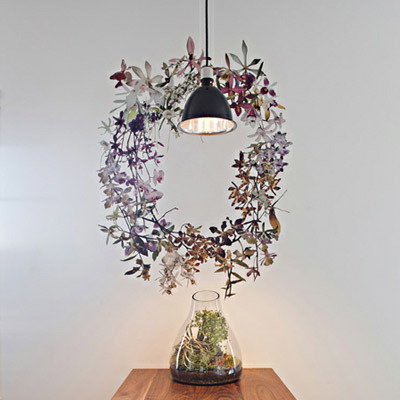 We have a Madewell in the 'burbs and the 2nd BHLDN shop in the US. Scout, Brimfield, Post 27, Broadway & Edgewater antique malls (right near each other), Orange Moon, Roost, Jayson H&G, Wooly Mammoth (these two new places look good but I haven't been yet: Roadtrip and Caza). I find the eat.shop guides, now renamed Rather, to be highly reliable. My friend Jess wrote the Chicago design*sponge guide. I am SO glad she included Xoco! Unbelievable. Go there. Chicagoan here, chiming in with personal support of Hopleaf, Map Room, and Delilah's. Uberstein is another personal favorite for food and beer right in Wrigleyville, if you want a small respite from the bros.
One of my favorite places in the whole world is Skylark. It's a bit out of the way, down in the Pilsen neighborhood (take the 8 bus on Halsted south to Cermak, it's on the northeast corner), but it's AWESOME. And don't let anyone tell you "Pilsen is scary", because it's not and they're dumb. Dive bar atmosphere, *~amazing~* local food, great draft beer selection, SUPER reasonable prices, and fantastic people watching. It's hipster central on Friday and Saturday nights and just standing around doing your own thing, gazing at the silliness around you is a great time. You can also get off the bus a few blocks earlier and check out all of the art galleries. Pretty much all of Halsted from 17th on down to Cermak is all art studios, some of which will randomly have open houses, most of which have great window displays, and all of which are great for peering into from the street. Oh, and for something to do in the comedy/drinking realm, I recommend Bye Bye Liver, a sketch comedy and bar thing. I know it has locations in a couple cities, but it's all local talent, at a neat local bar (Fizz), and a total hoot. Thanks Cathi - Skylark sounds like yet another must-go...don't know how I'll hit everything in one weekend! Yes to Skylark. Also, Nightwood is a restaurant a few blocks away from from Skylark and is a good place for a casual but special dinner/very good sunday brunch. Xoco has the best sandwiches in the friggin world. i think you named all of my favorite restaurants and bars... but i highly recommend division street between damen and milwaukee for shopping and restaurants! TWO - Go for the decor, stay for the food and "we call our favorite way to serve whiskey 'mother’s promise': two rocks in a glass and pour." Lush - Drinking in this city can get expensive so grab a bottle of $10 wine in their retail space then walk it over to their lounge. Au Cheval - Owned by the people who brought us Maude's Liquor Bar and Gilt Bar, this diner concept plays their music on a reel-to-reel machine and predominantly features eggs on the menu. Avec is near The Girl and the Goat and (dare I say?) even tastier. I would also check out the Violet Hour in Wicker park for A-MAZ-ING cocktails. And, how has no one mentioned Hot Chocolate in Wicker Park yet? Sunday brunch, James Beard award winning dessert, homemade marshmallows, need I say more? Have you been to Avec since Koren Grieveson left? I didn't suggest Avec because I wasn't sure if it would significantly affect the experience. But otherwise, I've always loved Avec (way more than Publican). Oh man, bummer! This was recent, as of a month ago it seems? I haven't been but the Yelp reviews since then are still overwhelmingly positive, so I assume the experience hasn't been affected that much. Still, I'm sure with a new chef will come changes. I'd still go though! Thanks Hillary! This is perfect! Can't wait to drink SO MUCH BEER!! Probs gonna gain like 10lbs this weekend...worth it. Lived in Chicago for 4 years and moved away 2 years ago, so this is also making me extremely homesick. This is an amazingly comprehensive guide, props to Hillary! I love all the suggestions I recognize and am bookmarking this page to hit up the ones I haven't been to next time I visit. * Avec (West Loop) is my favorite restaurant for dinner. Cozy, hip, communal dining style, with mouth-watering food in good portions, like their chorizo stuffed bacon-wrapped dates and pork shoulder. * For lunch, I recommend Hannah's Bretzel (downtown) for amazing organic sandwiches. * If you're in Ukie Village with a sweets craving, stop by Hoosier Mama Pie Co.
* For brunch, my absolute faves were Bongo Room (3 locations - Wicker Park, South Loop, and Andersonville) for their ridiculous sweet dishes that are actually like dessert (raspberry Oreo flapjacks, anyone?) and very hearty savories, and m.henry (Andersonville) for equally delicious food, lovely ambiance, and the best value. For music, my favorite spots are Schubas and the Hideout, both have an enveloping warm atmosphere and intimate sound. The Empty Bottle is great too but was too far for me living on the north side. Made me miss Chicago - great list!! The Gallery Cabaret is my favorite neighborhood dive in wicker park... have seen amazing local music there. For late-night drunk noshing go to Arturo's Taco's: mexican soap opera's, cheap and tasty burritos, killer decor and a juke-box (and fewer hipsters than lone star). Irazu Chigaco on North Milwaukee is delish... get the palmito salad or the pepito sandwich. mmmm Lizano sauce. For comedy I hear the improvised Shakespeare at iO Chicago is amazing. We caught a great night of stand-up recently at the Beat Kitchen's Chicago Underground Comedy. Second City is also a solid choice. If you're there before October 21st and you like theatre, I LOVED Timeline Theatre's 33 Variations. It's a really special play, with incredible live music. Check it out if you can. Ooooh, and check out the Thorne Miniature rooms at the Art institute! As well as the new wing, which is amazing. Man, I wanna go back now. Since Hillary called me out re: chicago beer, I figured I'd get definitive. - Solemn Oath in Naperville. This is our new hotness. Amazing taproom, cool guys, the best beer this year. - 3 Floyds in Munster, IN, it's seriously a short drive. And some of the best beer in the world. Don't get this close and not try it. And I love shepherding people to their next great beer, so email me or tweet @goodbeerhunting. It's like beer GPS. I think the majority of the suggestions above are great - but want to warn that Kuma's, Hot Doug's, and Hopleaf are know for their insane wait-times. I've waited an hour plus at each of those locations. Beware if you are on a tight schedule. For a solid list of quality restaurants in any neighborhood, I recommend checking out the Great Neighborhood Restaurant list, which is curated by a forum of local foodies. I've been to 80% of the places on the list, and it's rarely steered me wrong. The GNR App puts the list in your pocket and will locate recommended restaurants near you. Awesome guide. I went to school in Chicago, and I'm super excited to go back next month. Taking my boyfriend to visit for the first time. I would just add: For thrifting/shopping, go to McShane's Exchange. I once got a Mui Mui coat there for $30. I would add Bad Apple (http://www.badapplebar.com/) to the Lincoln Square list. Huge beer selection plus amazing burgers that are typically included on top 10 lists for Chicago burgers. Also if you're going to try Girl and the Goat, you're going to need to Open Table it at least two months in advance, unless you want to have a 4pm dinner on a Tuesday or a 9pm dinner on a Sunday. Yes, the Girl and the Goat is awesome but SUPER hard to get into. I second the recommendations for the Map Room, the Fountainhead, and City Provisions. The Local Option is kinda meh. If you're willing to shell out the money for tickets and drinks, the main stage shows at Second City are so funny your face will hurt from laughing. Also, I'm a fan of Swirlz Cupcakes. The Museum of Surgical Science is surprisingly awesome. Also, if the weather is decent, rent bikes and take a ride up the lake shore path. i was in chicago last october, and I LOVED IT. i'd recommend taking the architectural boat tour - it was an amazing way to see the city, and if you get a good docent it's even better! after we did that, we went to lunch at the purple pig, which i highly recommend. when i was reading reviews on yelp, everyone was going back and forth between the girl and the goat and the purple pig, and the purple pig was super easy to get into and the food was fantastic. YES! So glad you mentioned the architectural boat tour. I used to live downtown and I thought it was awesome. So really, it's one of the best "touristy" things I've done in Chicago. Another fantastic Bucktown restaurant - The Bristol (3 words - duck fat fries). Eat there then walk it off in the 4 blocks to the Map Room. Regarding the high sales tax, it may be worth it if you buy something relatively small but expensive to arrange at checkout to have it shipped to your home. That way, you pay for shipping but not sales tax (as long as the retailer does not have a brick-and-mortar store in your home state). Depending on the laws of your state, you could then be liable for paying taxes on the item once you get home . . . but no one actually does. And even if you had to, your local tax rate on the item could be much lower than Chicago's. I've been planning to go to Barcelona for 2 years now I just can't seem to work it in the budget ! But I'd love to read a city guide about it! Dang, Hilary totally nailed it! I'm homesick for all these places. What's the best way to minimize yield from the expensive organic turnips in your produce box? wake propeller ski and Wake Propellers for sale. Largest inventory of Ski and Wake Props, buy your Ski Propeller online and Save. Order your Wake Prop today. Almost everyone is piloting a boat, pulling a net, picking crab meat, or getting it all ready to ship off to your house.boat shaft seals Dripless Shaft Seals for sale. Largest inventory of Packless Shaft Seals, save up to 40% on all marine shaft seals. Buy your Dripless Shaft Seal today.